Day 27 of the Heapnose perfume diary. 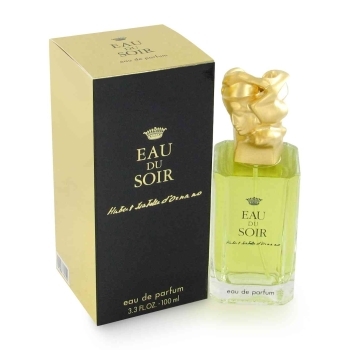 Today I am wearing Eau Du Soir by Sisley. There’s a fantastically romantic story behind my acquisition of this scent, the ingredients of which are a long distance relationship, a lovesick boyfriend and a Transatlantic treasure hunt involving fragrant clues which were mailed to me in lengthy love-notes. But why bore you with all of that when I could instead tell you about the most World’s Most Homosexual Party which I attended a few weeks ago, Sisley in tow. My friend Sisley is the fragrance that I bust out when I know I don’t look that good, or, as in the case of the World’s Most Homosexual Party, when nobody is going to notice what I look like anyway. It’s the sensory equivalent of control underwear – a reassuring confidence booster in a cold, hostile world. For one simple reason. Men Love It. Green scents are not traditionally regarded as knock outs. Released in the early 90s, and forced to jostle for position amongst throat ticklers such as Samsara, Poison and the dreaded Chanel No.5, Eau Du Soir, unlike its contemporaries was not regarded as a mainstay on the nineties power-suit / big eyebrows scene. But, this Chypre-based fragrance out-classes all of them. Turning the traditionally weak concept of a green fragrance upside down and quite literally entering the room before its wearer, this is THE head turner of the nineties. Thankfully, its somewhat overpowering introductory notes mean that 20 years on it’s failed to capture the public imagination. It didn’t belong to the nineties, and it certainly isn’t fashionable now, but it’s the fragrance that I get asked about over and over again. And it is the only fragrance that needs no topping up. 8am to 6pm – it just keeps getting better. Which is how I knew that this was quite simply the only perfume which could possibly be worn to the World’s Most Homosexual Party. As expected, I was the fattest person there. Or, as my (homosexual) companion generously observed “…there was like totally one guy there that weighed more than you.” I was also the most clothed. Though, it being a male underwear launch, one can hardly gripe. But my goodness did I smell good. Even as I plowed through my eighth barbecued chicken leg (well, nobody else was going to eat them) Sisley remained, defiant in a sea of oiled torsos and over-worked facial topiary. Three compliments. From three nearly-naked homosexuals. A good day’s work. Apologies for the recent Heapnose hiatus readers…It’s been a busy few months, and, well, Canadians are less generous with their perfume samples than the Brits, despite their claims of a higher standard of living. Christmas recommendations coming soon…If you’d pass them on to my boyfriend, I’d be much obliged.